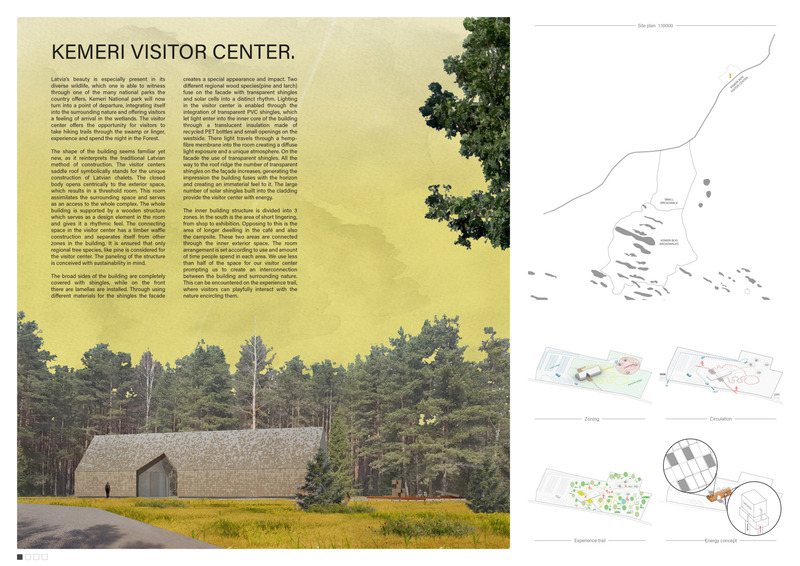 Kemeri National Park covers 380 km² in western Latvia. 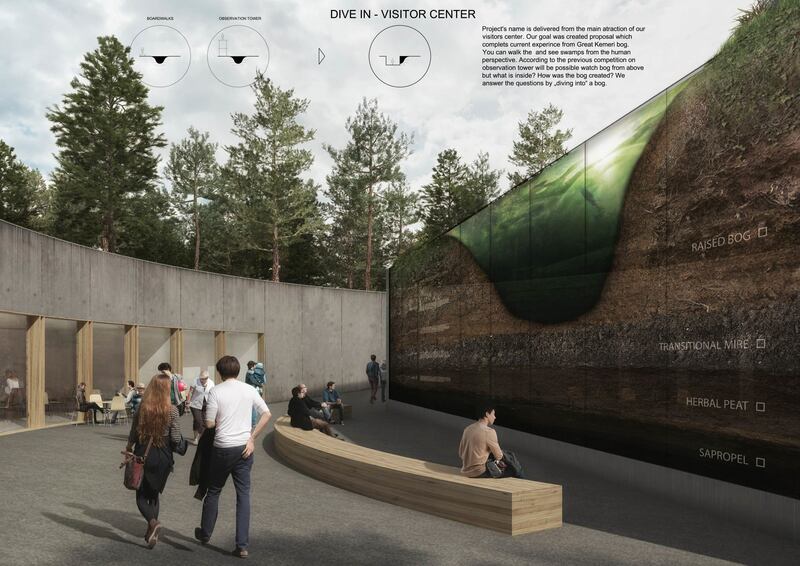 It is the third-largest national park in one of Europe’s greenest countries, situated one hour by train from Latvia’s capital city of Riga. The park is home to a wide range of wildlife including black stork, and moose, deer, elk, foxes, wolves, wild cattle and horses. 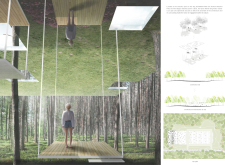 It was established in 1997 to protect an important region of Latvia’s forests, lakes, natural mineral springs and marshlands. 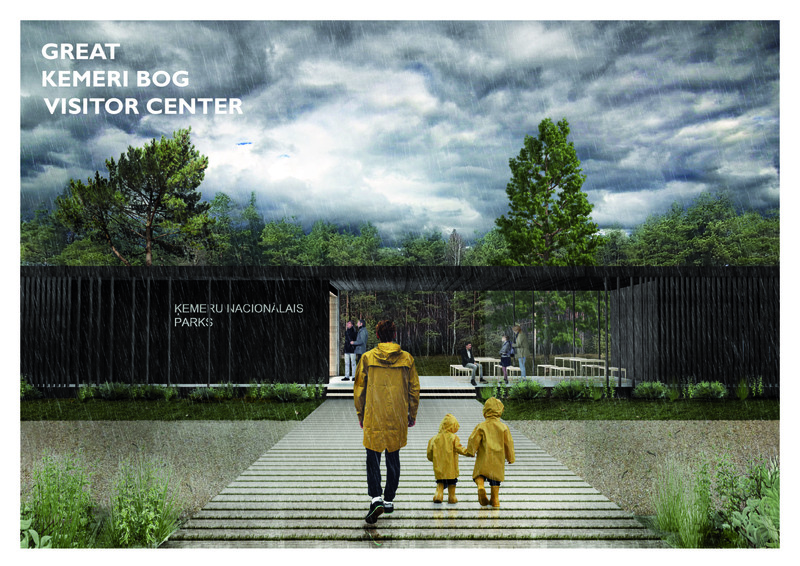 Nearly 25% of the park consists of rich wetlands, the largest collection known as the Great Kemeri Bog - a popular destination where visitors can walk along a network of boardwalks that spans several kilometers. 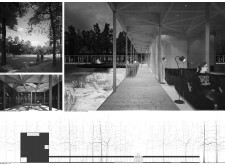 Here, one can discover up close the wetlands and its special collection of flora and fauna, including mosses and stunted trees. 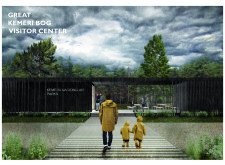 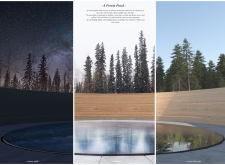 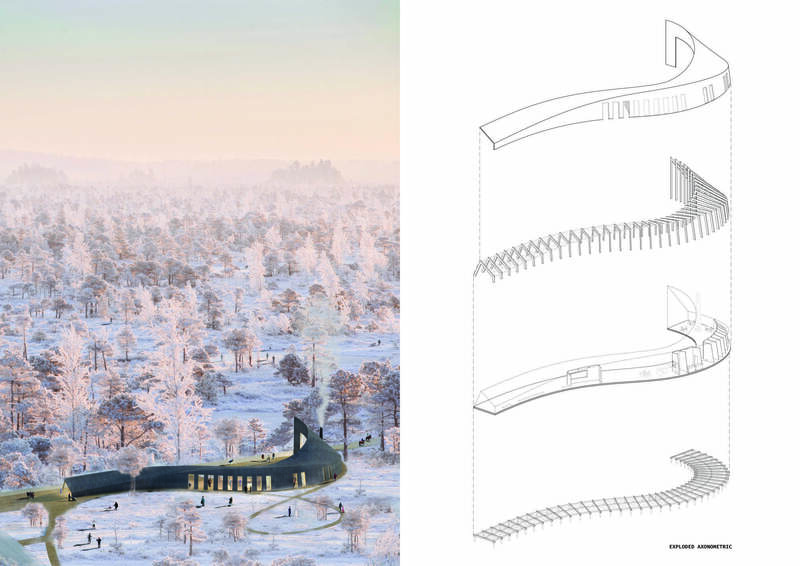 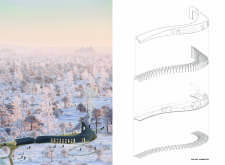 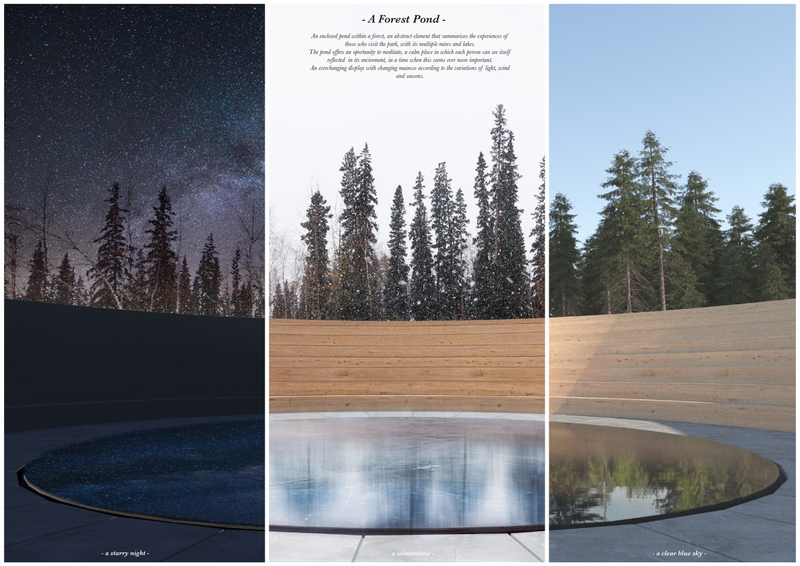 The Great Kemeri Bog Visitor Center architecture competition invited participants to submit designs for an iconic entryway to the park. 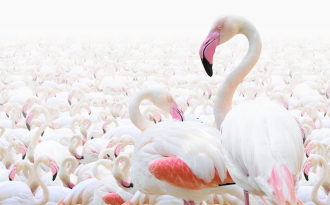 The competition is run in partnership with the Latvia Nature Conservation Agency, the organization charged with managing and protecting the park, and which has expressed interest in constructing the winning proposal. 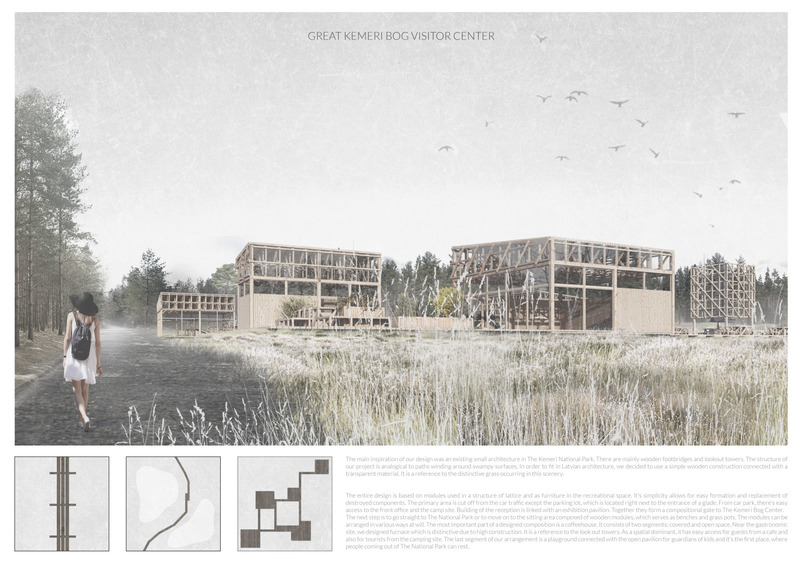 This is the second architecture competition in a series organised by Bee Breeders in conjunction with the conservation agency. 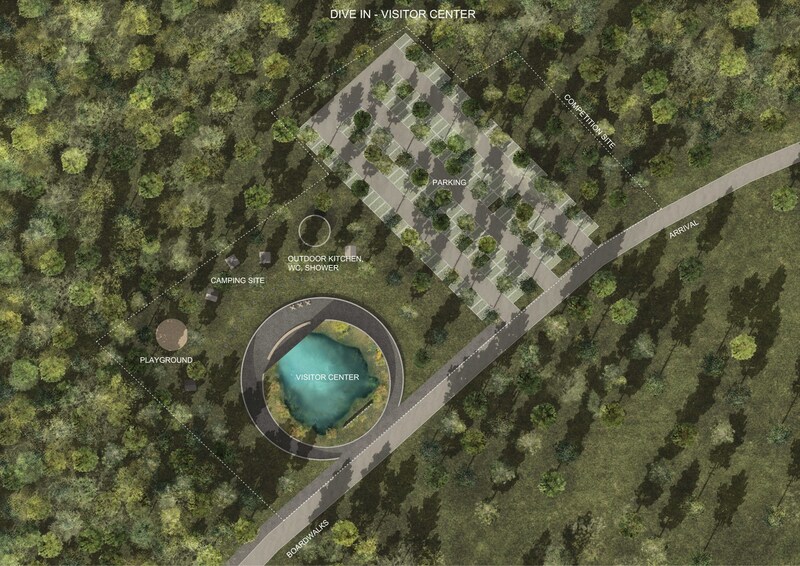 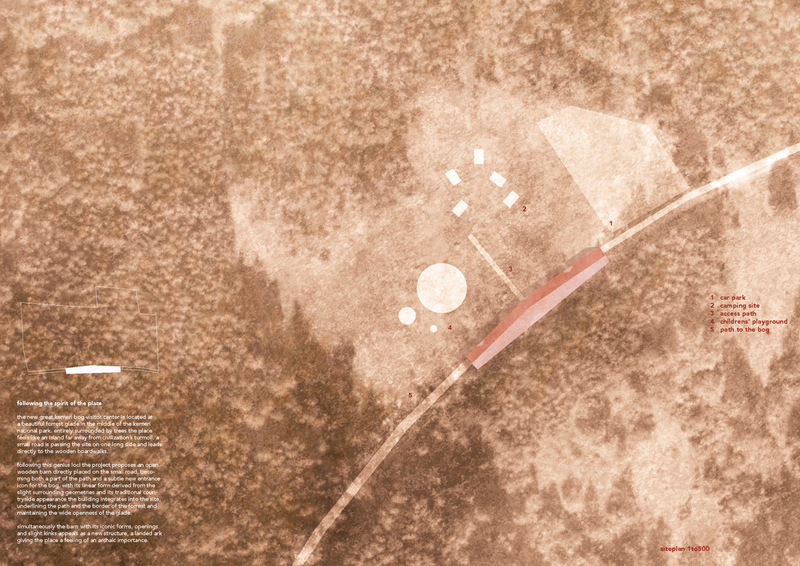 Earlier this year, the Kemeri Park Observation Tower Competition delivered design proposals for a buildable observation structure situated along the boardwalk system that allows visitors new ways to view and experience the Great Kemeri Bog. 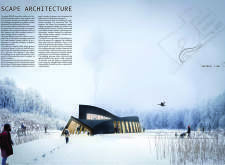 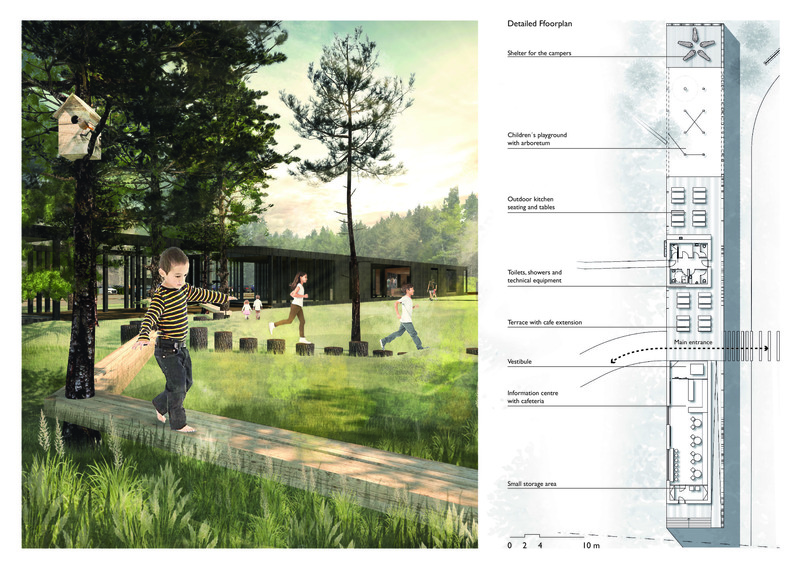 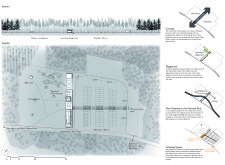 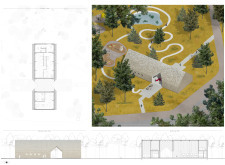 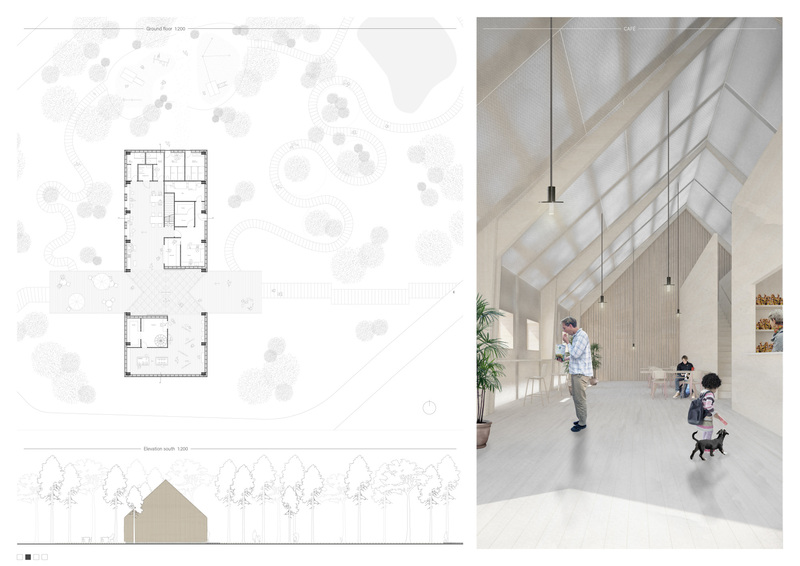 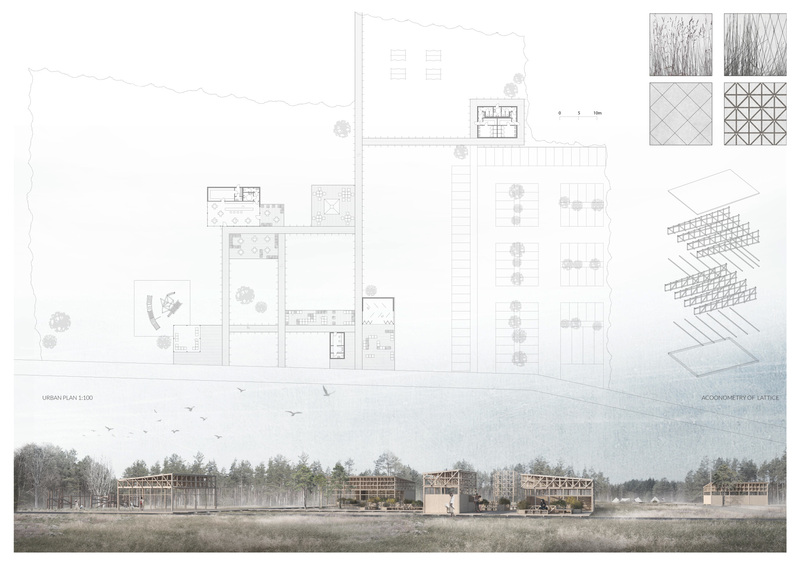 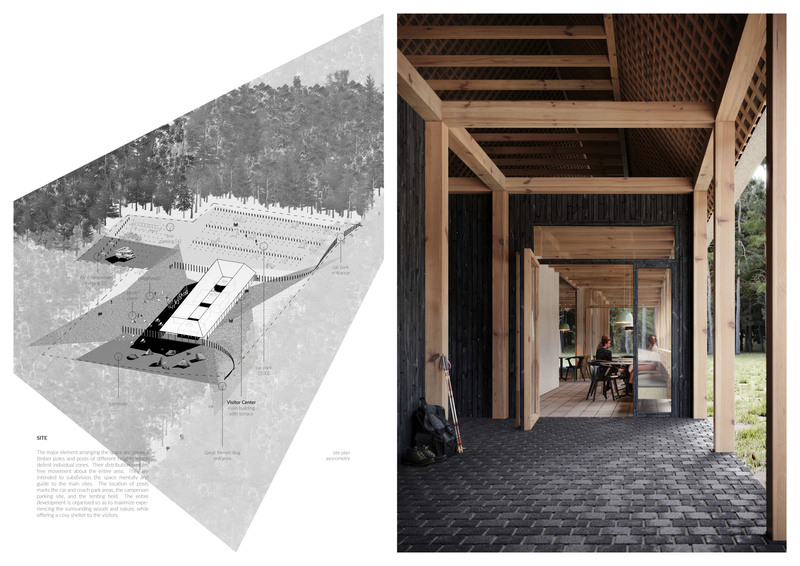 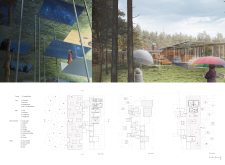 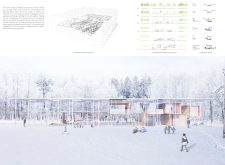 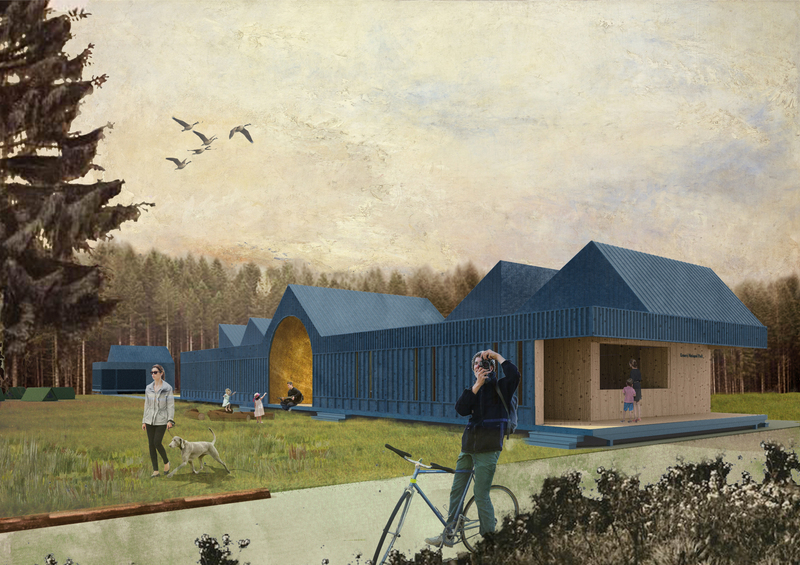 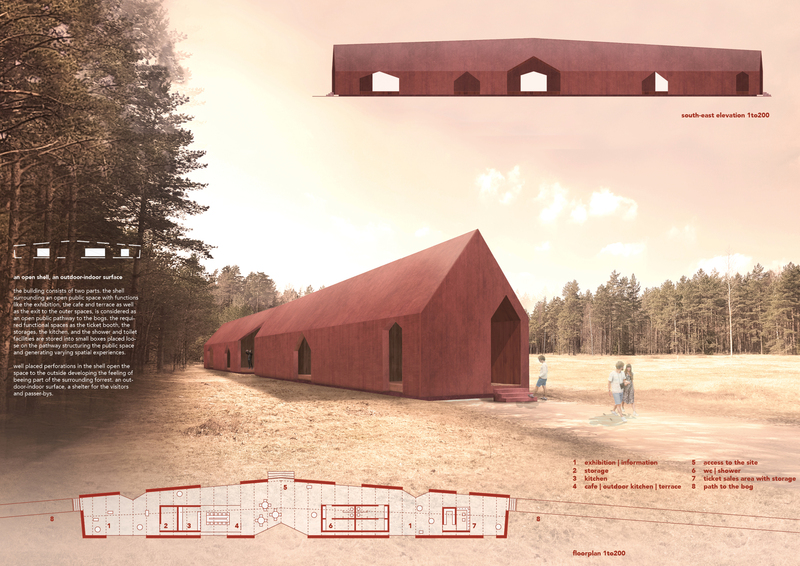 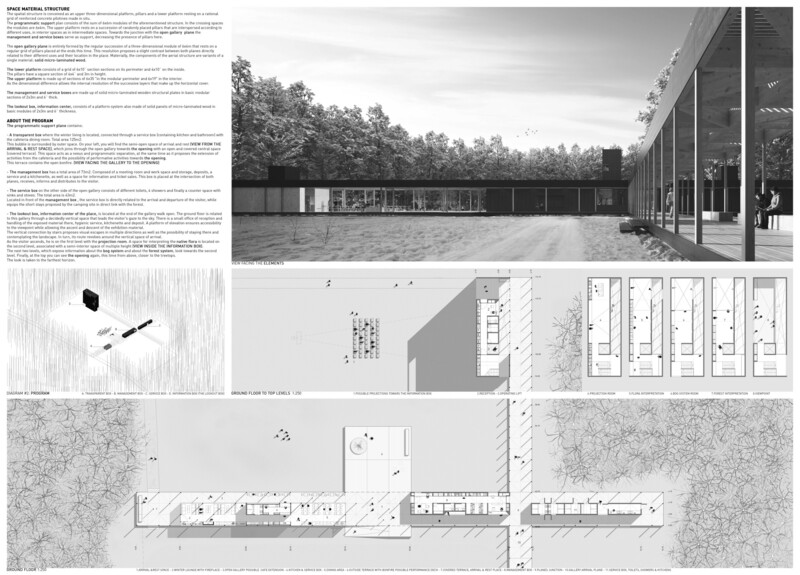 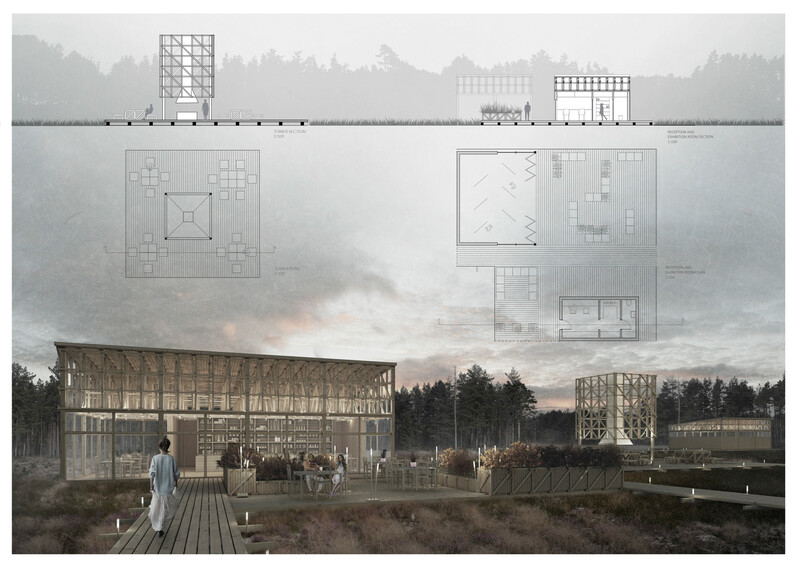 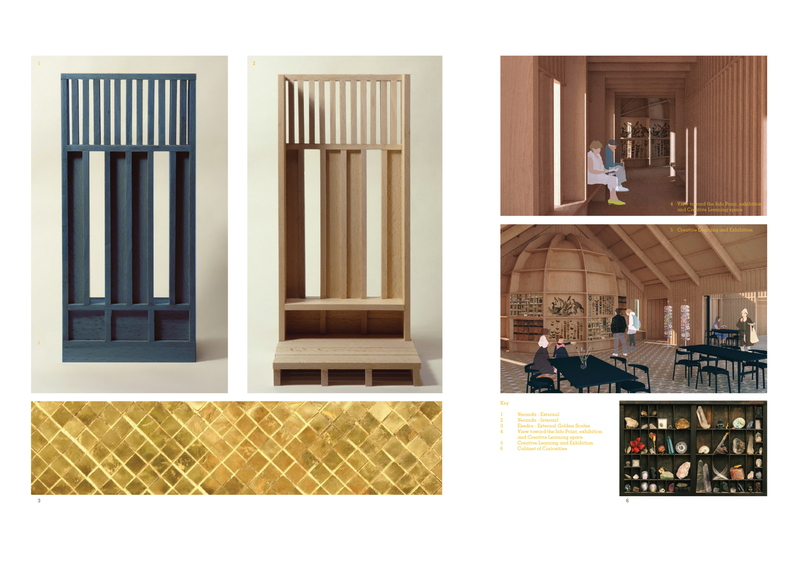 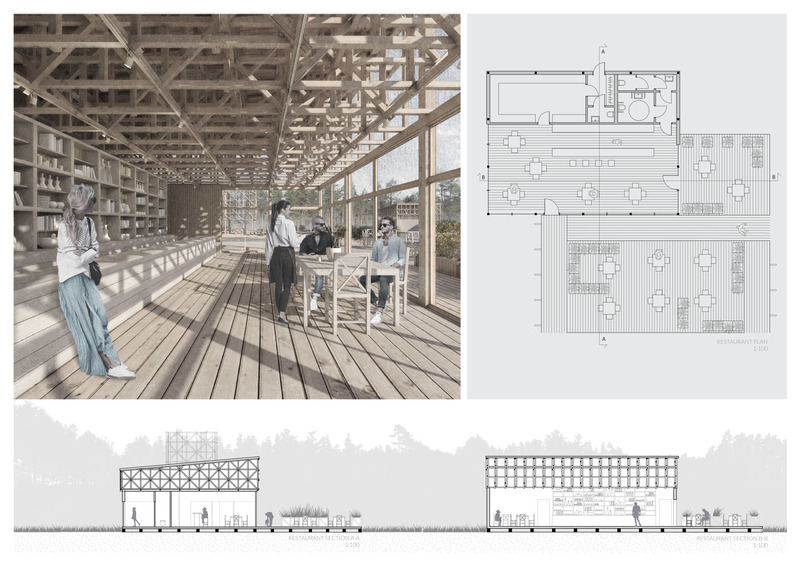 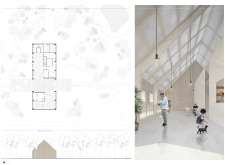 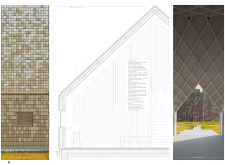 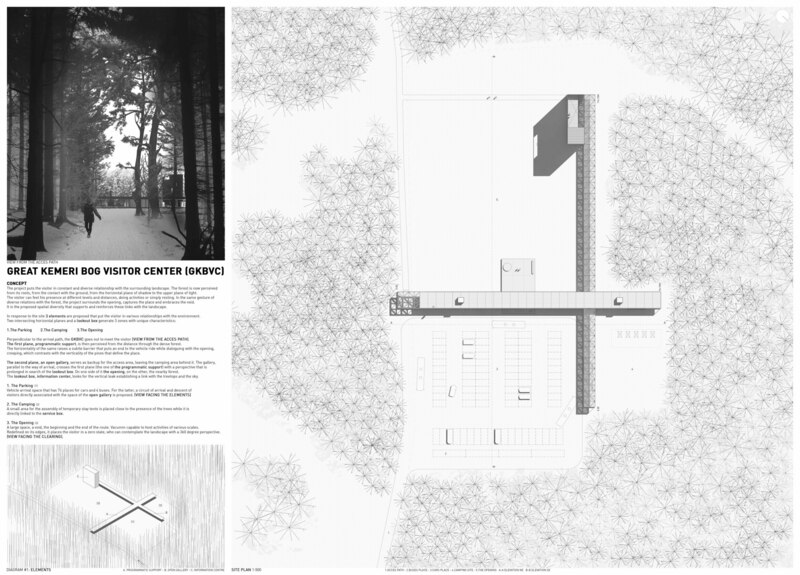 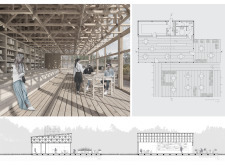 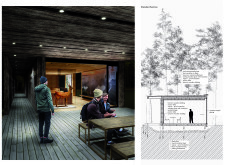 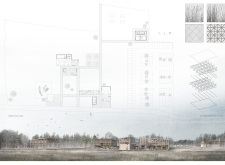 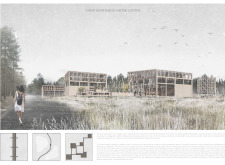 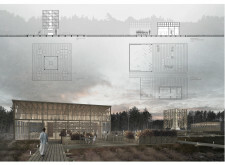 In the current competition participants were tasked with designing a visitor center on a site located at the entry to the Great Kemeri Bog boardwalk. The site is currently used as a car park and gathering point for boardwalk visitors. 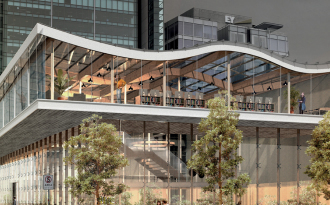 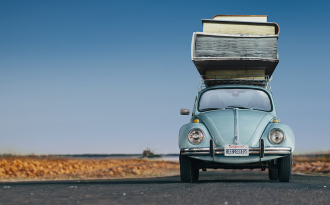 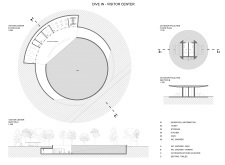 The proposed design program consists of: an information centre with a cafe, terrace, and external ticket window; a camping site with access to shower and toilet facilities; a children’s playground; and a car park with the capacity for 100 vehicles. 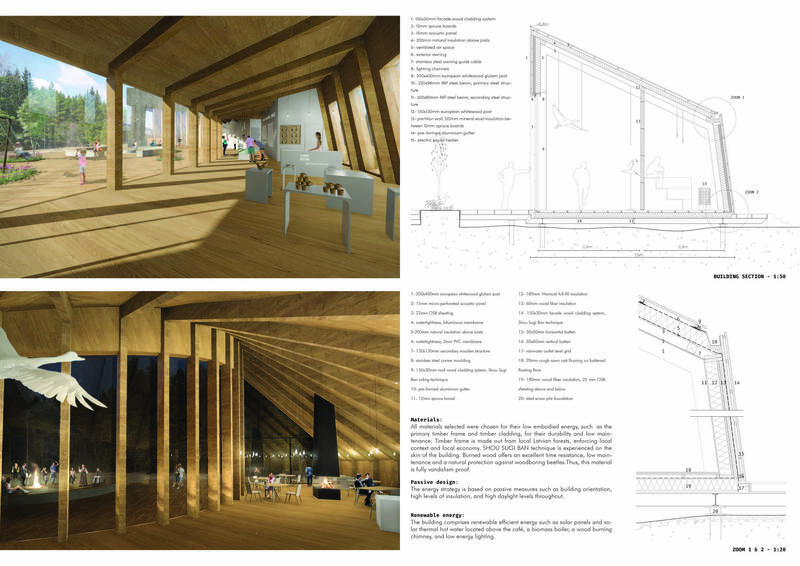 It was requested that structural elements be made from durable materials. 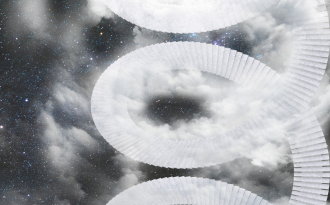 There were no dimensional requirements or budget. 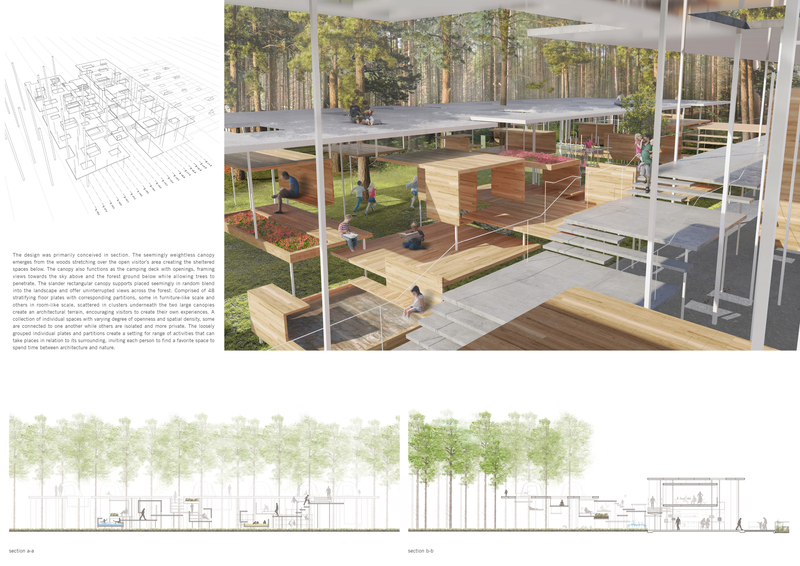 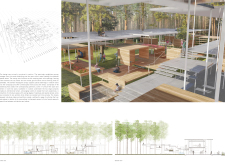 As the winning projects will be considered for construction, designs were judged for their integration within the park and sensitivity to the environment, the use of sustainable materials, and constructability. 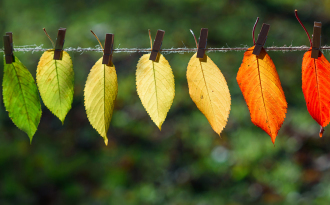 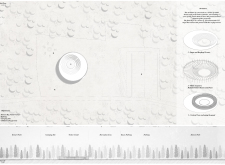 A range of ideas were submitted at various scales. The jury in particular focused on designs that have the potential to become a new landmark for the park and for Latvia. 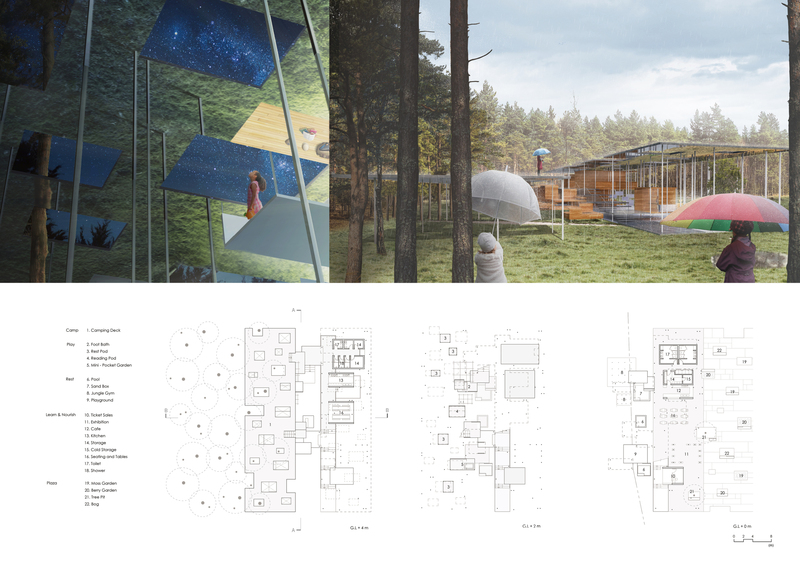 The high quality of the winning projects as well as the honorable mentions reflects the outstanding level of work submitted. 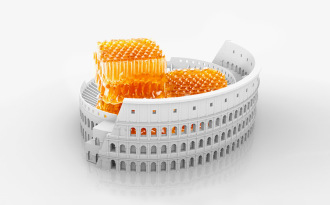 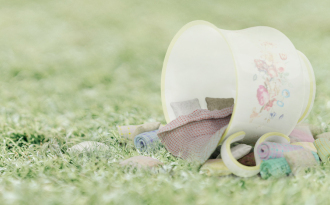 Bee Breeders would like to thank all entrants for their participation. 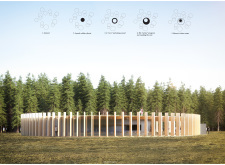 This project is perhaps the most effective at establishing a gateway to the Great Kemeri Bog. The rectangular-bar form set perpendicular to the entry drive firmly separates the vehicular entry from the camping grounds and pedestrian network of pathways, and filters visitors through a single access point that also becomes the starting point for the bog’s network of wooden boardwalks. 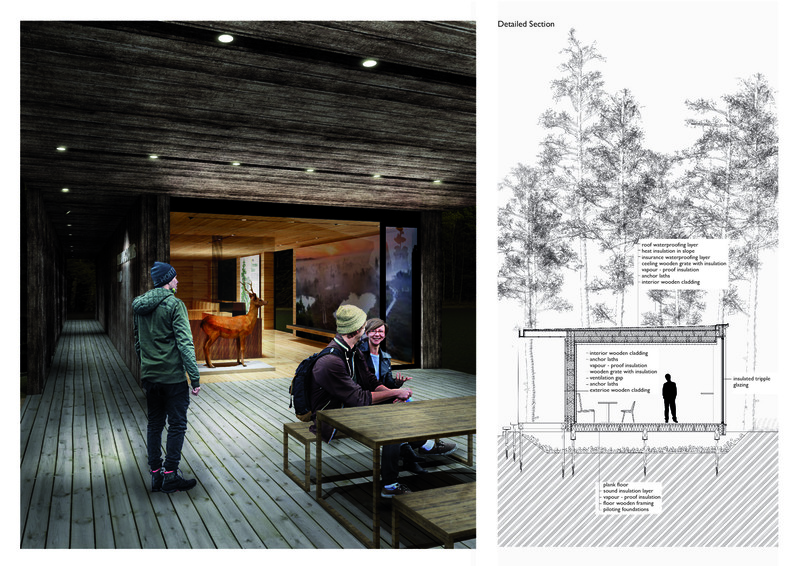 The sectional drawing expresses the project’s constructability, and the interior images reflect its simple use of natural materials. 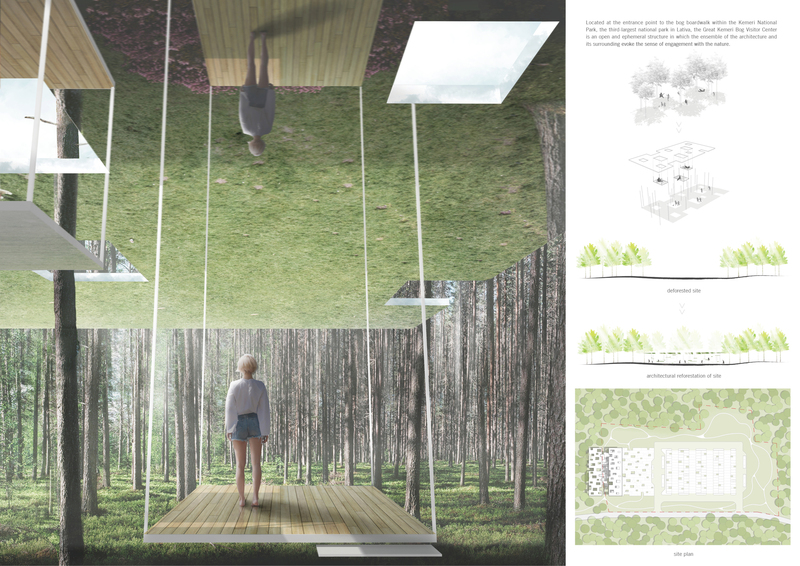 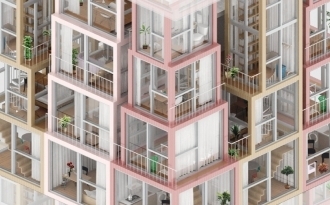 The varied layout of its vertical facade module gives the otherwise harsh block form a more natural aesthetic that is clearly related to the trees of the surrounding forest. 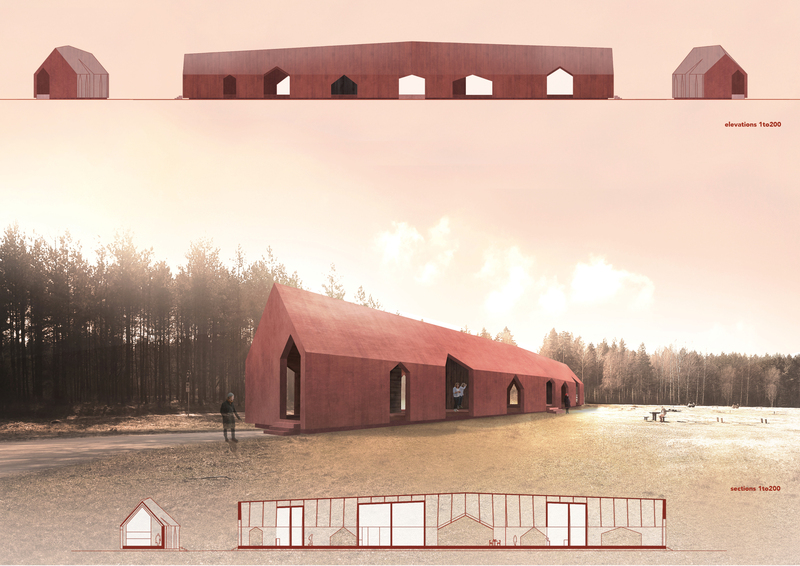 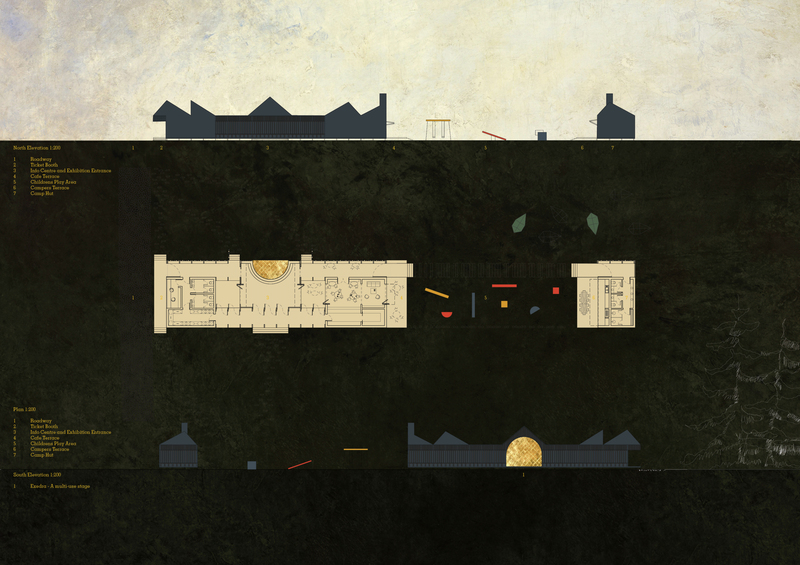 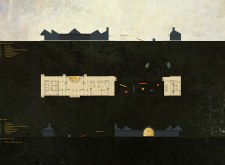 The project stood out to the jury for its simple, strong form. 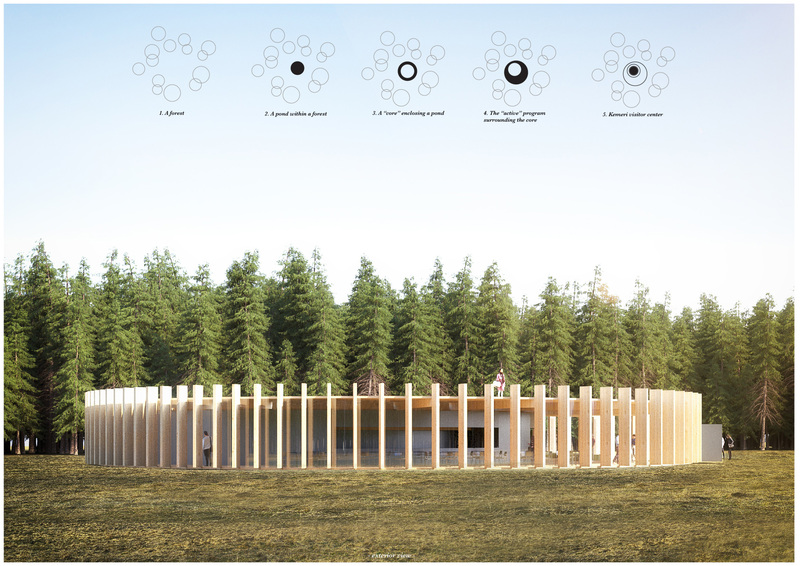 The circular visitor center’s repetitive and visually permeable facade of timber posts both connects to the surrounding site and encloses a space which monumentalises the relationship of the site with water. 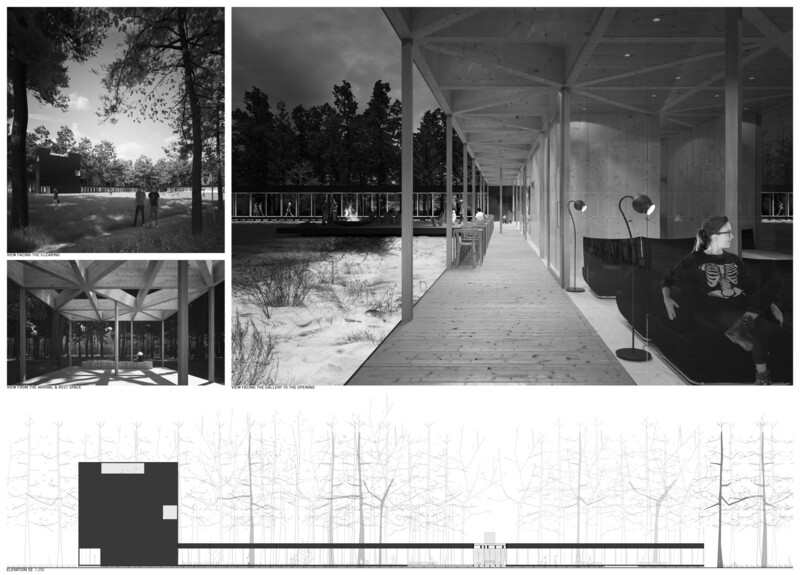 The central exterior space offers a quiet meditative area that focuses on the pond and the sky, yet it also has the potential to be used for group events. 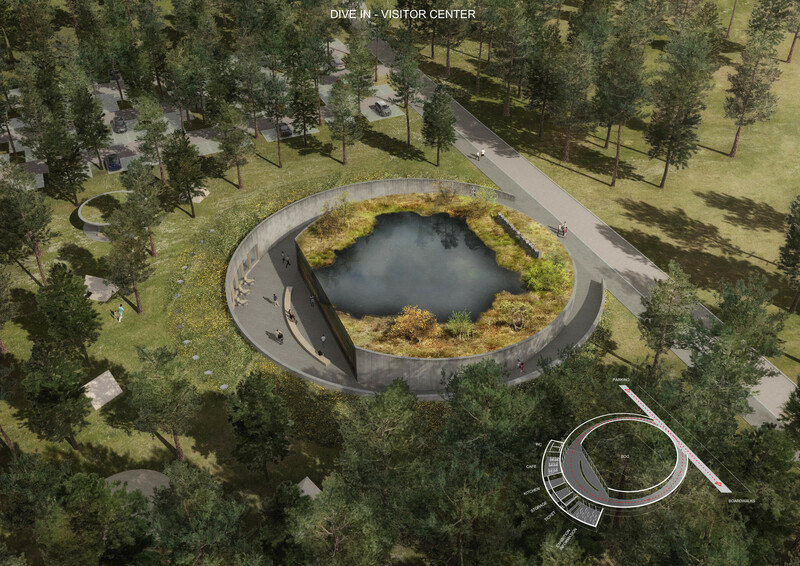 The walkable roof offers special views of the park. 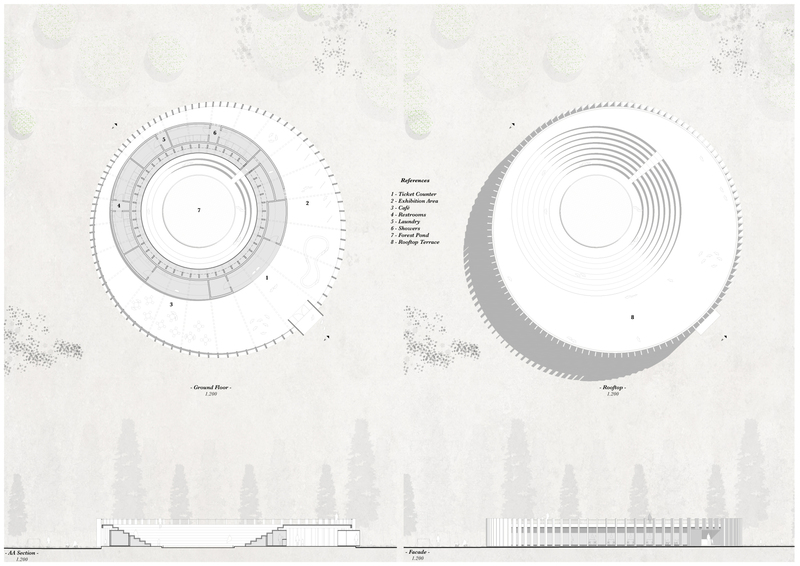 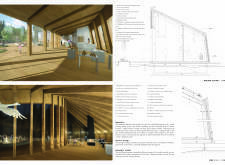 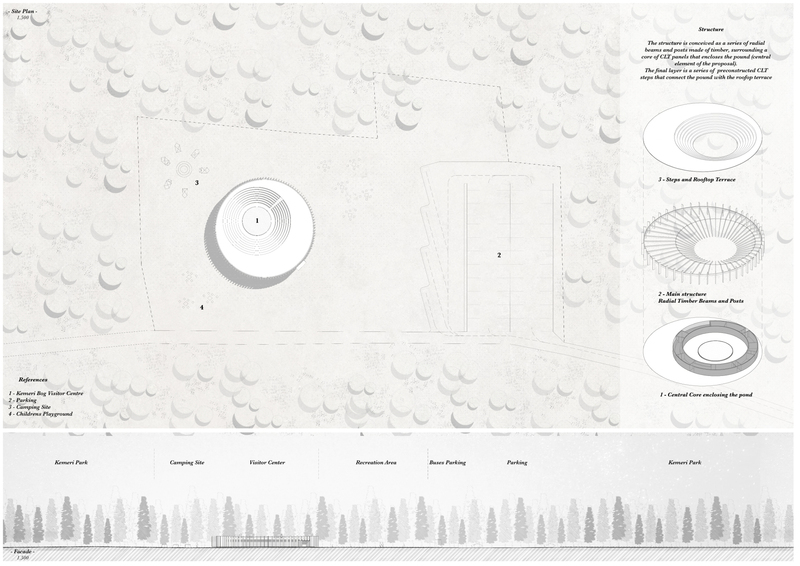 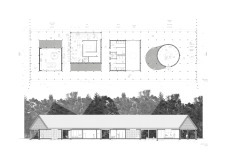 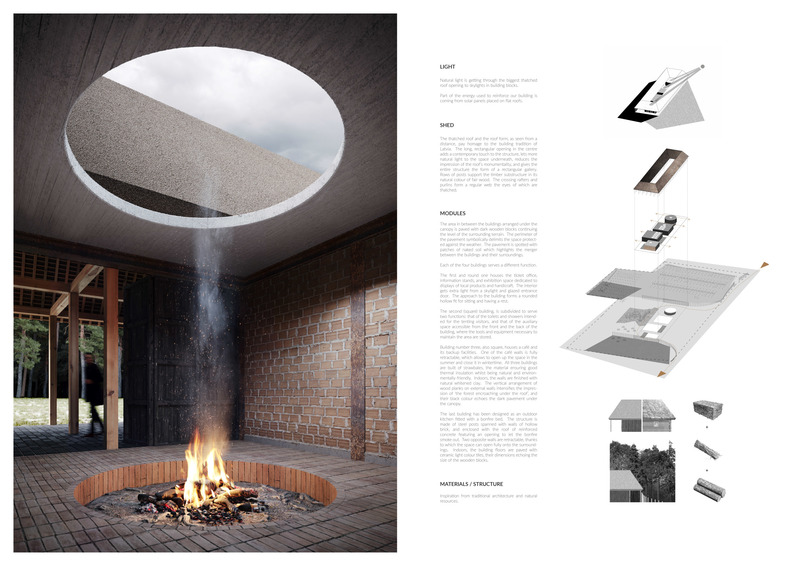 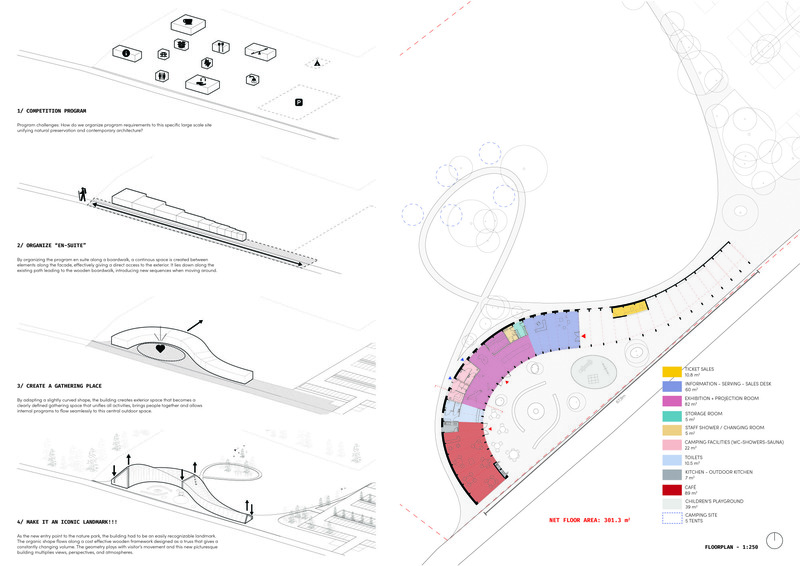 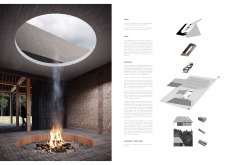 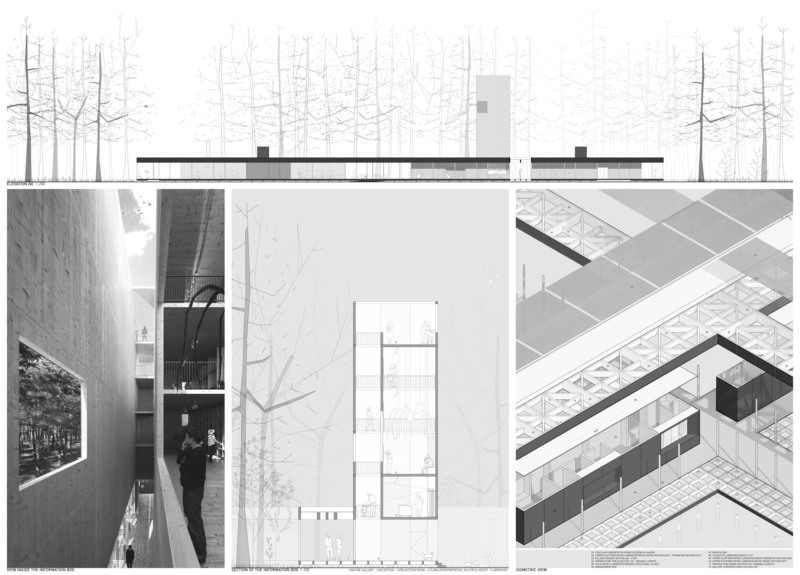 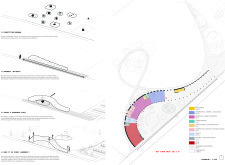 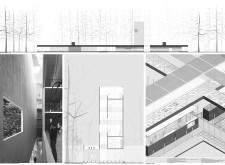 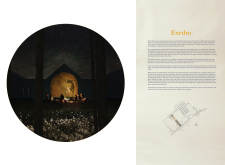 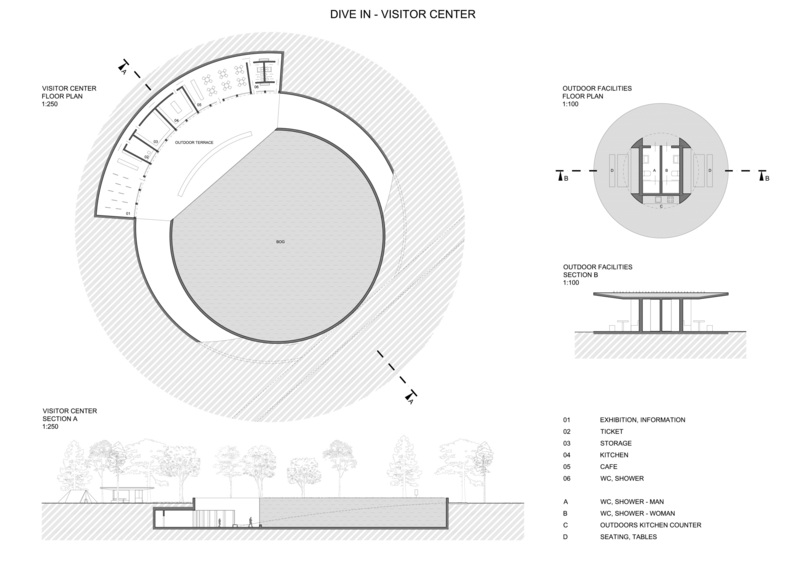 The drawings and images are extremely effective at describing the circular form’s minimal disruption to the site. 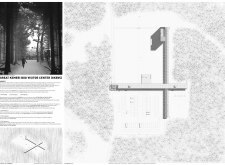 While the building’s central location on the site clearly sets it apart from the parking and within a natural ‘reservation area’, the jury would recommend the designer to further consider the building’s access from the car park and drive, as well as its connection to the bog boardwalk. 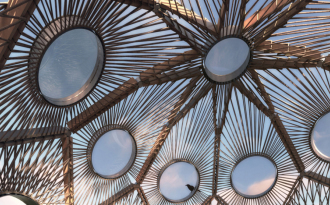 The design is commended for its use of a repeatable and constructable module that manages to create an organic, landscape-like form. 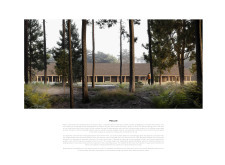 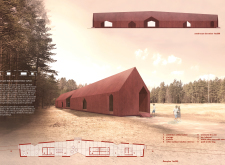 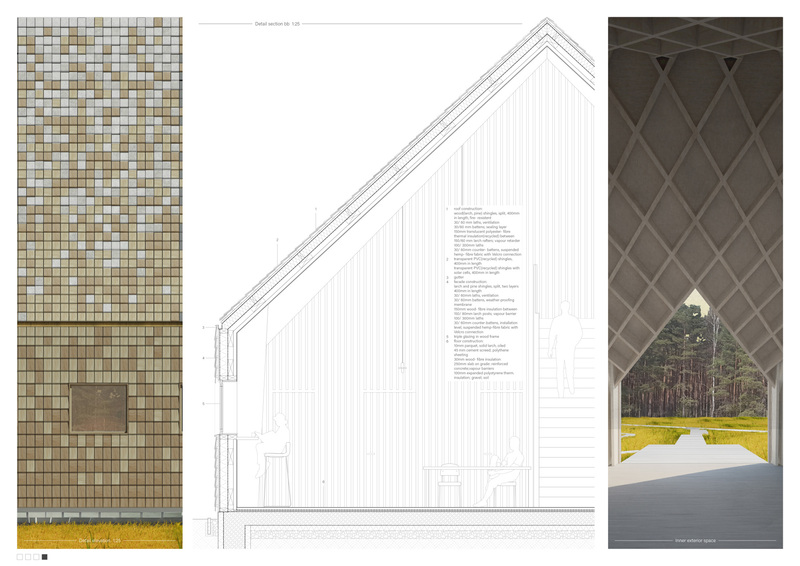 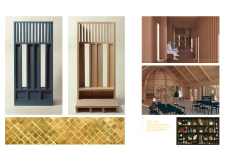 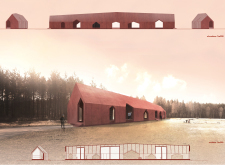 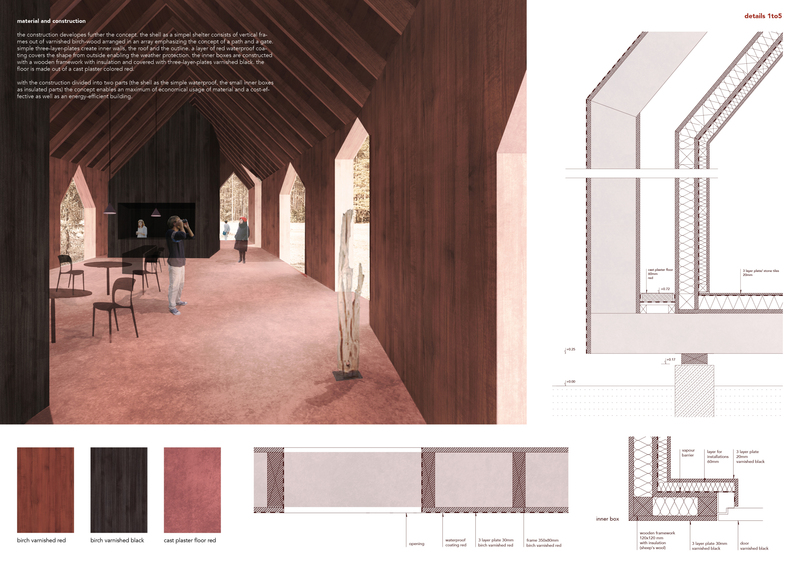 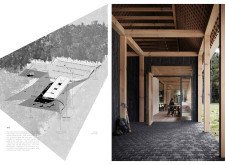 The project proposes a burned-wood cladding that fortifies it against Latvia’s variable weather, and interiors of natural wood that connect it well with its forest surroundings. 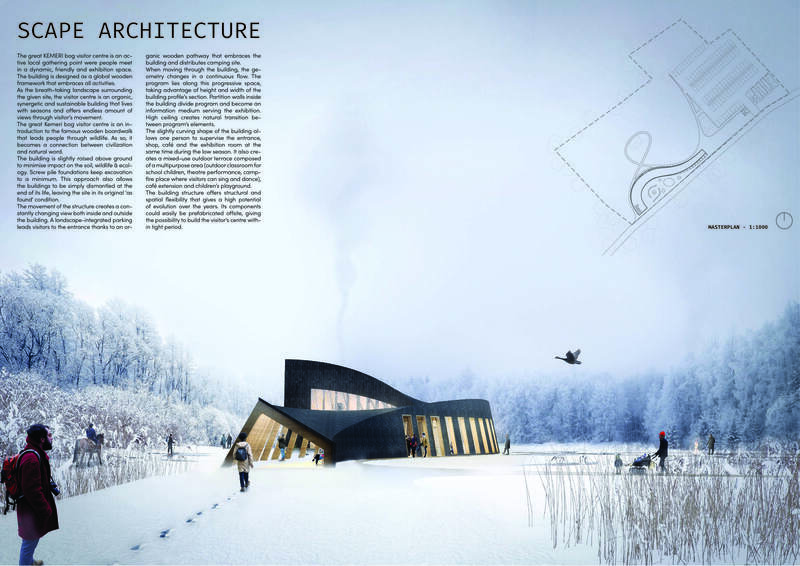 The section drawings and details are especially well-considered for modularity and construction using sustainable materials. The building’s plan form strongly establishes a central gathering space, however the jury questions the vertical pitches and dips and wonders if the geometry might rather relate more strongly to its internal program. 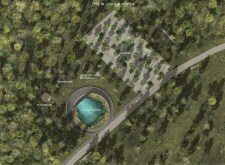 The project certainly has the potential to become a park landmark.